The second work by Estonian Sumera 'Pantomime' is equally dramatic and haunting. An eastern-sounding, and very much ornamented, ocarina bends its notes for the first three minutes - to be replaced with a dance rhythm reminiscent of Béla Bartók's Hungarian Dances (if they had been transposed into mediaeval times). Different dances compete for attention in a modern day polyphony, producing interesting cross-rhythms, before clearing, time and again, back to a dance refrain. The last two minutes return to the haunting single line of the ocarina. Although born in the Ukraine, Grigorjeva was a pupil of Sumera at Tallinn State Conservatory and has been a member of the Estonian Composers' Union since 1994. Her two works 'Con misterio' (written 2001) and 'Lahkumisele (on leaving)' (1999) frame the Sumera on the CD. 'Con misterio' is a setting of four 20th century Russian poets (Velimir Hlebnikov, Fyodor Sologub, Konstantin Balmont, Elizaveta Kuzmina-Karavayeva) and is a view of the crucifixion. 'Con misterio' begins with 'Incantation' for unison male voices and continuo bass, to which is added more instruments in a tight round, with the instruments echoing the singers. Reaching a powerful climax, the round clears into a chorale for the last few bars. 'Lullaby' for soprano is more melodic largely due to the performers clear and expressive voice - the accompaniment is mainly long held lines on the instruments with the addition of vocalised hisses. 'Of soul' is again dark with baritone, brass and buzzing. Tremolo violins add more tension and breaks in the vocal line are filled with fluttertongue flutes and frenzied strings. This is contrasted with a section of airy woodwind and held organ notes to end. 'Aria' is a sadder, lamenting alto song where we can feel the suffering of Christ and his mother Mary – its discordancy resolving into repeated soft chords at the end. The final work 'On leaving' sets Russian Orthodox texts 'Jesus Christ our Lord and the Virgin Mary on the hour of Leaving Orthodox Souls' and 'On burying lay people'. 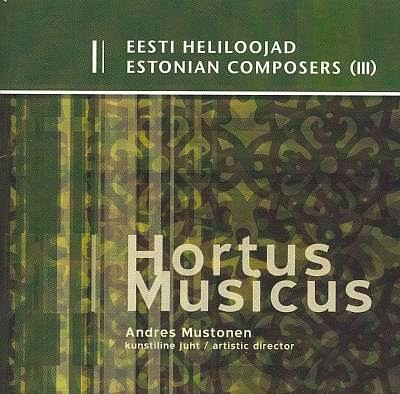 The prayer 'Lord have mercy' entitled 'Without haste' is a modern interpretation of polyphony that by now is recognisably Estonian. 'With quiet sadness' features a slow sonorous cello melody, decorated by bright percussion and flute which gradually takes over until the cello reasserts itself. Underneath is an accompaniment which moves from continuo to rapidly moving harmony and back. 'Darkly' grates away in the lower registers and contrasts with 'Serenely' in higher voices. Both are more hymn-like in texture than the first two movements. Finally 'Restrainedly' brings together these hymn-like harmonies with the lilting held-over suspensions typical of both Grigorjeva and Sumera. This CD was an unexpected pleasure. Both the meditative compositional styles and the instrumentation chosen by the composers, along with the performance by this talented and unusual ensemble, made a lasting impression.